The kids will be bubbling with smiles when they find Peppa Pig: Bubbles in their stocking or gift wrapped under the tree this year! 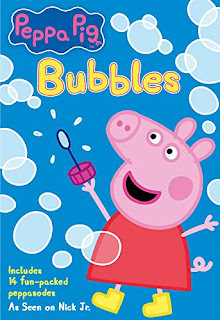 · On December 2, Peppa Pig will be back but this time in a 14 episode DVD titled Bubbles. This lovable, cheeky little piggy will be up to her usual activities – playing games, dressing up, visiting exciting places, making new friends and of course, jumping up and down in muddy puddles! Peppa is a loveable, cheeky little pig who lives with her younger brother George, Mummy Pig and Daddy Pig. Peppa loves playing games, dressing up, visiting exciting places and making new friends, but her absolute favorite thing is jumping up and down in muddy puddles! Peppa Pig: Bubbles makes the perfect stocking stuffer or gift look for it December 4th in stores and on www.amazon.com. Peppa wants to give you a chance to win your own copy of Peppa Pig: Peppa's Christmas (check out the review here) the perfect seasonal DVD and Peppa Pig: Bubble's the perfect stocking stuffer today just enter here http://www.freeforallfans.com/2014/10/peppa-pig-peppas-christmas-dvd-review.html! Halloween Party Ideas by Celebrate Express!